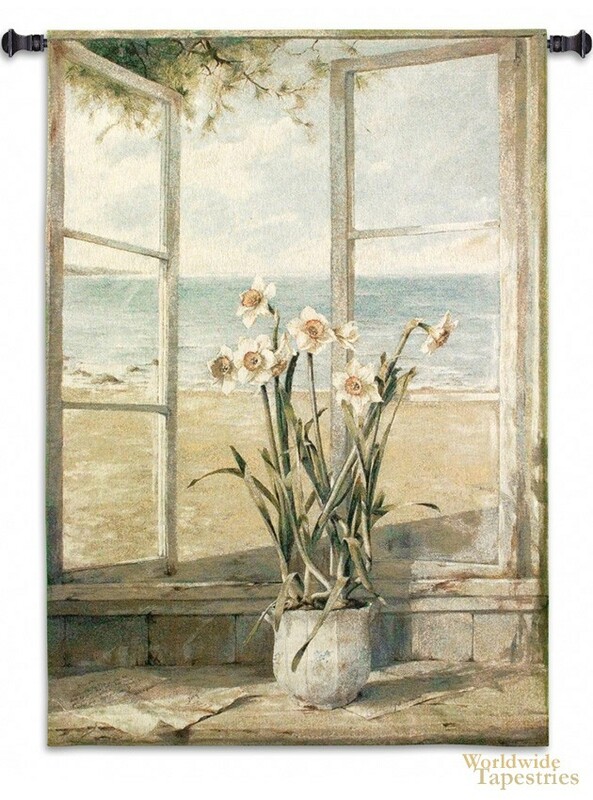 A gorgeous seaside tapestry "Ocean Narcissus" shows a blooming narcissus by the ocean seaside. From a painting of Fabrice de Villeneuve, this tapestry reflects the love affair that this artist has with flowers, still life and the ocean. Here he captures the salty and fresh breeze of the sea with the open windows and displays before us a beautiful Narcissus plant that captures our attention as we look out to the rolling waves in the beach. This work is beautiful and evocative at the same time. De Villeneuve's ability to capture a sense of place and to capture one moment in time in his tapestries is his trademark. This floral tapestry "Ocean Narcissus" is backed with a lining and has a tunnel for easy hanging. Note: Tapestry rod, where pictured, is not included in the price.